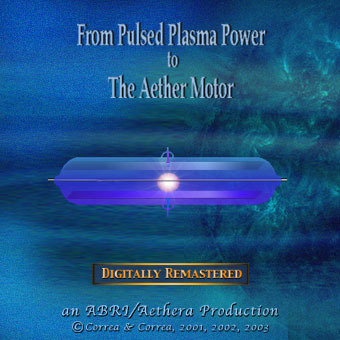 ORDER the DVD "From Pulsed Plasma Power to the Aether Motor"
"From Pulsed Plasma Power to the Aether Motor"
A 3-part documentary on the work of Dr. Paulo Correa and Alexandra Correa in 1987-2002. With introductions by Dr. H. Aspden and Dr. E. Mallove. Format: DVD; No Region. Running time: about 100 min. The pulsed plasma experimental and applied research at Labofex - from the isolation of the PAGD regime, to the invention of PAGDTM inverter applications with Spinners and Flywheels, and to the XS NRGTM Converter System. The Aether/ORgone Motor-Converter technology - from the work of N. Tesla and W. Reich to its development by the Correas at the Aurora Biophysics Research Institute (ABRI). Filled with simple demonstrations of massfree aether energy - in vacua, the ground, the atmosphere, the human body - this documentary illustrates the existence of an energy realm which has heretofore been both ignored and grossly misunderstood.